Event raised money for Connect to End Violence, a Martha’s Vineyard Community Services program. LadyFest had them dancing in the street. Or, more accurately, the avenue. Throngs of music lovers crowded a closed down Circuit avenue in Oak Bluffs Saturday night to celebrate Island women in music. From 7 p.m. until well after the clock struck midnight, “female fueled” bands played on three stages to enthusiastic crowds. The Ritz Cafe, presenting sponsor for the event, extended its venue and its dance floor out the doors and into the street where tables were set up in an enclosed area. The Outskirts kicked off the night of music on the stage inside the Ritz, with Delaney Pickering leading the way on electric guitar. A fresh new talent in the Island music scene over the past year, Ms. Pickering drew several rounds of applause for her guitar solos. 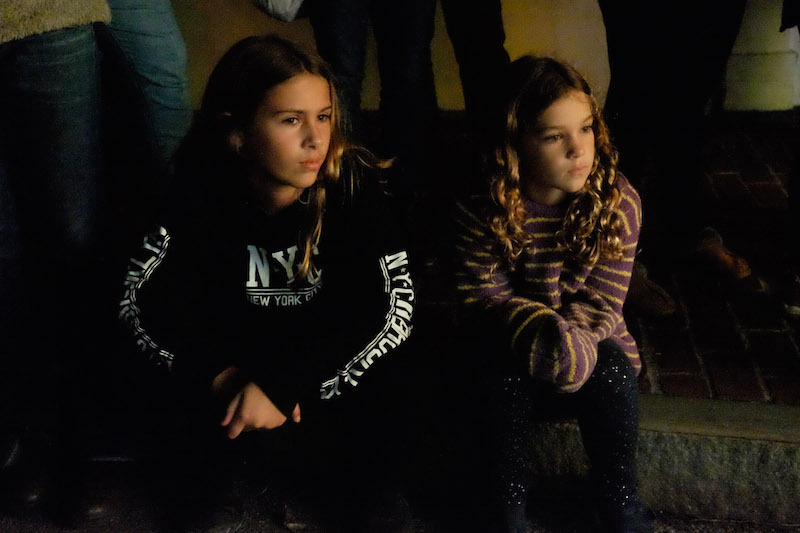 Outside, on a stage set up on the street just off Healey Square, singer-songwriter Lucy Mayhew played and sang her own compositions for a small but appreciative crowd. LadyFest gave some artists like Ms. Mayhew, who do not often get a chance to play in public, a venue for their music. “This was my second ever solo live show, so it was terrifying,” Ms. Mayhew said. 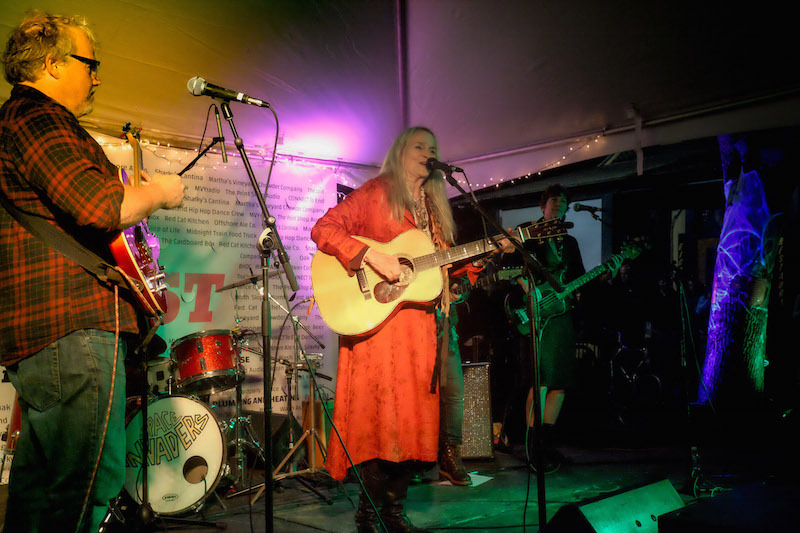 She overcame her stage fright in part, she said, because LadyFest raised money for Connect to End Violence, a Martha’s Vineyard Community Services program the provides crisis intervention and support for victims of domestic and sexual violence. Down the avenue, at a larger stage set up in front of the Island Theatre, a steady parade of female musicians entertained the growing crowd. For many, it was a chance to meet old friends on a night out. WMVY radio host Allison Hammond handled announcing duty for the event. Island favorite Kate Taylor wowed the crowd with several original numbers, including a song inspired by a walk along Menemsha Pond. 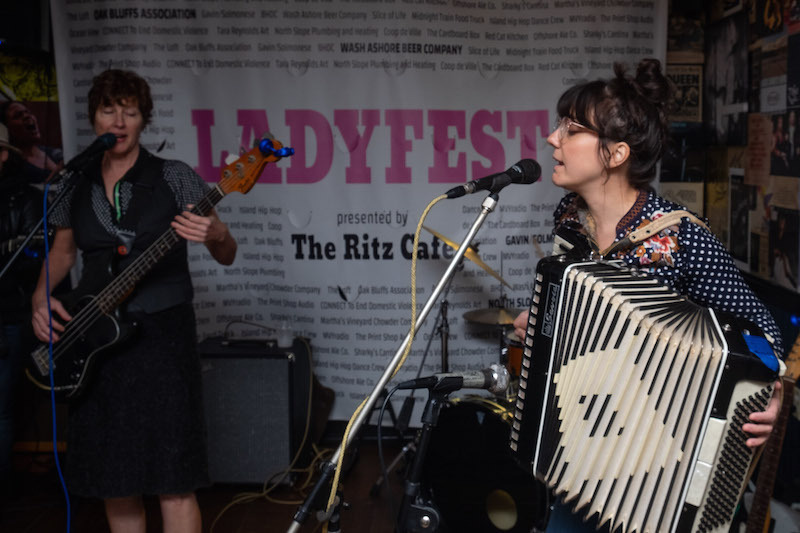 LadyFest began last year as an event inside the Ritz, and expanded to Circuit avenue with permission from the town of Oak Bluffs this year. Ms. Taylor had even bigger ideas. Musicians slipped up and down the avenue, and in and out of back up bands, to support the women leading the show. Rose Guerin and her band took the main stage with an eclectic set of music. Ms. Guerin, and Ritz manager Kelley Feirtag, were the main organizers of the event. The outdoor music ended with a finale on stage, with many of the musicians joining a hard rocking version of Proud Mary. Jemima James, who had just finished an Americana themed set on the Healey Square stage with her son Willy Mason backing her up on drums, was still feeling the energy of the crowd as the festival wrapped up.